Get these free e-books for more handy beginner tips: Why AutoHotkey? and AutoHotkey Tricks You Ought to Do with Windows! Is AutoHotkey Right for You? Maybe someone mentioned AutoHotkey to you or you came across it while surfing the Web. There is nothing obvious about the name AutoHotkey or what it does. Searches on AutoHotkey can generate many questions while answering only a few. Is AutoHotkey something that you want for your Windows computer or is it merely another free utility which doesn't help all that much? The purpose to this article is to review the free AutoHotkey Windows utility for people who know little or nothing about it and give some insight on how it's used. By the time you reach the end of this page you should be able to determine if AutoHotkey is something which warrants further investigation or if it's not for you. While this article only covers the most basic of AutoHotkey techniques, there are numerous interesting apps explained in and the e-books listed at the bottom of this page. Some of the latest quick apps include a barebones music and video player and an instant hotkey app (no AutoHotkey required). It is true that AutoHotkey is a powerful scripting language which can solve many complex problems, but there is no need for the average novice to do any of that. Unlike most other software environments, you don't need to know very much about AutoHotkey to make powerful use of it. If later you decide that you want to learn more, fine—but at the start you want to concentrate on the two most basic functions of AutoHotkey: Real-time text replacement and setting up hotkey combinations which run programs, visit Web sites, and speed up operations in your other Windows programs. Note: AutoHotkey is compatible with all current versions of Windows—from XP to Windows 10! then save that line in a text file with the AHK extension (i.e. myemail.ahk), I can run that script with the AutoHotkey program creating one hotkey combination. Every time I type “j@” and hit the space bar, period or comma, then the full address (jackdunning@gmail.com) will replace those two characters. This will happen everywhere on my Windows computer, whether I'm using Microsoft Word, Outlook Express, a Blog on the Web, Notepad, or any other text editing field. You can immediately see the use for this line of code. Plus, it is not limited to just one item. An AutoHotkey script can be a series of lines similar to that above, each creating a shortcut key combination which can save you time plus wear and tear on your typing fingers. In one case, thousand of such lines are included for auto-correcting the most commonly misspelled words in the English language. The second basic feature of AutoHotkey is the creation of hotkey combinations to run your favorite programs, visit your favorite Web sites, speed up functions within other Windows programs, or run much more complex AutoHotkey scripts. For example, suppose you wanted to quick load your Web browser and visit a particular site. That one line of code which can be saved in a text file with Notepad using the AHK extension (i.e. openwepage.ahk could be the name of the file) will open the default browser and navigate to the ComputorEdge Web site after pressing the space bar while holding down Windows key ( ). The # sign is the character used to designated the Windows key ( ) in an AutoHotkey combination. The double colon (::) is commonly used in AutoHotkey to designate text replacement and hotkey combinations. In text replacement the double colon is used at the beginning of a line to indicate the keys which will activate the replacement when pressed in order. The second double colon designates the text which will replace the first text. When a hotkey combination (keys pressed simultaneously) is setup, those characters begin the line, followed by the double colon. The command (or set of commands) which follow the double colon become the action executed when the hotkey combination is pressed. It is that simple to get started with AutoHotkey. All you need is to install the AutoHotkey program which runs in background (see the AutoHotkey Web page) and the ability to write or save a simple text file. AutoHotkey can become much more complex, but if you only need the basics then you can be up and running in a very short time. If you want more, then there is plenty of help available. 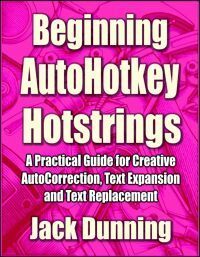 Jack regularly writes beginning AutoHotkey blogs at " Jack's AutoHotkey Blog." I have posted these scripts at the ComputorEdge AutoHotkey Dropbox download site. Many programs such as Microsoft Word has features similar to those offered by AutoHotkey. You can do text replacement with a set of commonly misspelled words plus create macros (hotkeys) for quickly executing regular tasks. However, those tools in Microsoft Word only work in Word and a couple of other Microsoft products. 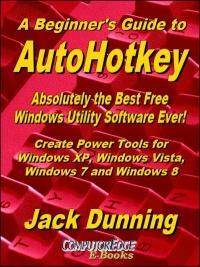 AutoHotkey works everywhere you use it whether in a Windows program or on the Web. It even works in Word. AutoHotkey gives you an universality that you won't see in most Windows utilities. 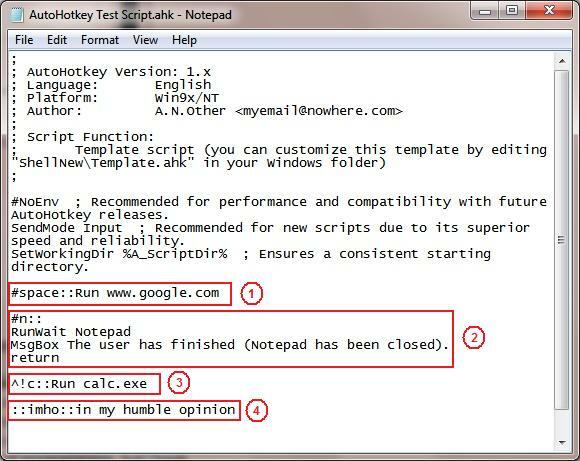 AutoHotkey is easy to set up and use. It has tremendous flexibility. There is a long list of AutoHotkey commands which can be use for everything from sizing and moving windows to adding calendar events to your Windows computers. But you don't need to use any of these commands to get great benefit from AutoHotkey. AutoHotkey is Open Source which means no one person or company owns it. There are no license fees and you are free to use your scripts anywhere you like. 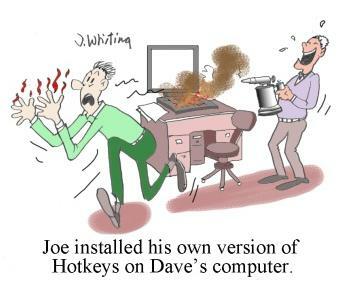 There are very dedicated individuals who maintain, update and support AutoHotkey. They can be found by visiting the AutoHotkey Forums. If you are concerned about how safe AutoHotkey is, see this AutoHotkey Forum topic. 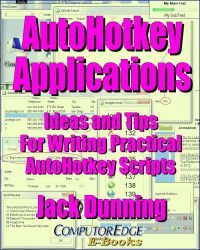 To see more of the many possible applications for AutoHotkey check out "Free AutoHotkey Scripts and Apps for Learning." 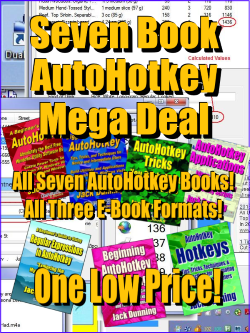 Get this e-book for a useful overview, AutoHotkey Tricks You Ought to Do with Windows! Also available at Amazon.com! 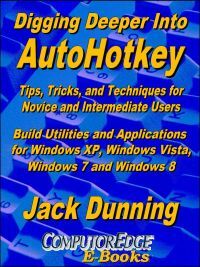 Now available in e-book format, Jack's A Beginner's Guide to AutoHotkey, Absolutely the Best Free Windows Utility Software Ever! : Create Power Tools for Windows XP, Windows Vista, Windows 7, Window 8 and Windows 10. 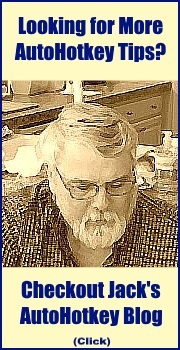 Also available at Amazon.com for the Kindle and Kindle software. 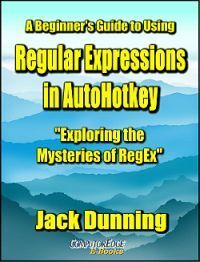 Jack's second AutoHotkey book which is comprised of updated, reorganized and indexed chapters from many of his sample applications is available at ComputorEdge E-Books. The book is organized and broken up into parts by topic. The book is not for the complete beginner since it builds on the information in A Beginner's Guide to AutoHotkey. However, if a person is reasonably computer literate, they could go directly to this book for ideas and techniques without the first book. Jack shows how to build real world AutoHotkey applications. The AutoHotkey commands used are included in a special index to the chapters in which they appear. Even I can't remember everything I wrote." To get more detailed information about AutoHotkey and see a List of AutoHotkey commands visit the AutoHotkey Web site. • Autocorrect over 5,000 commonly misspelled words in any Windows program or on the Web. • Set a reminder for a later meeting. • Use QuickLinks to replace the missing Windows 8 Start Menu (or just to make life easier in any version of Windows).